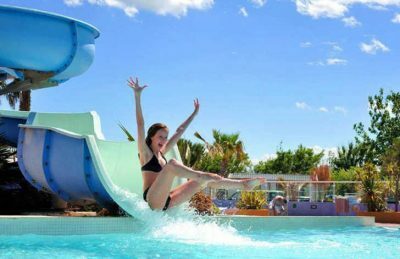 Camping Marisol is without a shadow of a doubt one of the most popular and most spectacular campsites in the Roussillon region of France, if not the south of France. This fabulous 5 star quality campsite lies within 9 hectares of pleasantly landscaped grounds and offers pretty much everything you could possibly want from a family holiday location. Unlike many other campsites in France, Camping Marisol offers a unique well being centre which is dedicated entirely to the art of relaxation. Their beauticians offer a wide variety of different treatments including massages, facials, manicures, pedicures and much more. You’ll also find a sauna, steam bath, jacuzzi, and a cardio centre to ensure you really have everything you need. One of the best things about Camping Marisol is its direct access to the beach. From your accommodation it’s possible to hear the sea and within seconds you can be on a fine sand covered beach that stretches out for in excess of 4km. The beach has been granted Blue Flag status and is the perfect place for families to have fun in the sea and on the sand long into the evening. If you think that a great location and spa is all that Camping Marisol has to offer then you’d be pleasantly mistaken. At the heart of this spectacular campsite is an equally spectacular swimming pool complex boasting plenty of sunbathing areas, heated tropical swimming pools, rivers, slides and a splash and play area for younger children. Camping Marisol campsite offers a comprehensive selection of activities and facilities on site and also nearby to ensure you have a fantastic family holiday. On site activities at Camping Marisol campsite include a multi sports area, fitness area, spa, table tennis, football, basketball, boules, archery, playground and cycle hire. Facilities available at Camping Marisol campsite include WIFI, restaurant, takeaway, bar, groceries, snack bar, animation team, games room, tv room, washers and dryers. Accommodation at Camping Marisol campsite includes a range of 2 and 3 bedroom mobile homes that are available from Suncamp. You can also book camping pitches for your own tent, mobile home or caravan at Camping Marisol.